(CNN) -- The U.S. Senate gave final approval Friday to a $787 billion recovery package that President Obama hopes will help boost an economy in freefall with a combination of government spending and tax cuts and credits. Sen. Sherrod Brown speaks to Senate Majority Leader Harry Reid at right on the Senate floor Friday. Approved earlier by the House, the plan -- which went through multiple permutations as it bounced back and forth on Capitol Hill over the past week -- now goes to Obama's desk, where he plans to sign it into law by Presidents Day. Spending in the package includes about $120 billion for infrastructure -- new projects repairing bridges, roads, government buildings and the like -- more than $100 billion for education and $30 billion on energy-related projects that Obama says will create "green jobs." More than $212 billion goes to tax breaks for individuals and businesses, and another $267 billion is in direct spending like food stamps and unemployment benefits. The Congressional Budget Office has predicted that the plan will create between 1 million and 3 million jobs. Most individuals will get a $400 tax credit, and couples will get $800. The vote by the Senate took several hours longer than a simple roll call of its 100 members generally would. Sen. Sherrod Brown, a Democrat from Ohio, attended a wake for his mother until about 8 p.m. Friday. 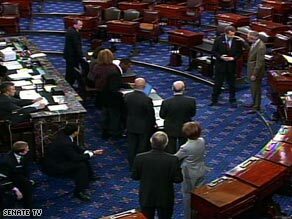 Voting began about 5:30 p.m. Then, the Senate chamber sat nearly empty until Brown arrived to vote about five hours later. He was flown from Ohio to Washington on a plane provided by the White House, which said no commercial flights were available that would have allowed Brown to cast a vote and return to Ohio in time for his mother's funeral Saturday. As had been the case when the original version of the package passed, the stimulus package garnered no Republican support in the House. The compromise legislation, which was hammered out by House and Senate leaders and White House staff over the past several days, passed in the House on a 246-183 vote. Three Republicans -- Susan Collins and Olympia Snow of Maine and Arlen Specter of Pennsylvania -- supported it in the Senate. Their support was needed to give the plan the 60 votes needed to keep it from being shut down by Republican parliamentary procedures. All Democrats in the Senate supported the plan. Seven House Democrats opposed it. Although the package was signed off on by leadership Thursday, a written version wasn't available to most lawmakers until about 11 p.m.
Other lawmakers, however, said they were hopeful the stimulus plan would get the economy back on track. "We know this bill alone will not solve all of our economic woes overnight. We know that the road back to economic stability and prosperity will require hard work over time," said Rep. Ed Perlmutter, D-Colorado. "But this bill is the right size and scope necessary to truly help us turn things around." Sen. Edward Kennedy, D-Massachusetts, who returned to Capitol Hill for votes this week, was not present for the final vote because he returned to Florida to continue his recovery from brain cancer. The bill passed the Senate 60-38. Most individuals will get a $400 tax credit, and most couples will get an $800 credit. That amounts to an extra $13 a week in a person's paycheck, starting in June. That's less than what Obama campaigned on: $500 for individuals and $1,000 per couple. Many students will get a $2,500 tuition tax credit. First-time home buyers may qualify for a tax credit of up to $8,000. People who receive Social Security will get a one-time payment of $250. The overall package is estimated to be 35 percent tax cuts and 65 percent spending, Democratic sources said. CNN's Ted Barrett, Dana Bash, Lisa Desjardins, Evan Glass, Mark Preston and Deirdre Walsh contributed to this report.